In a previous Stogie Tip, I passed along some things to remember when it comes to aging cigars. Here, we go in-depth with Doc Stogie, whose Stogie Fresh website is unique in rating cigars and evaluating their aging potential over time. Stogie Guys: What part does aging play in your enjoyment of cigars? Doc Stogie: I mostly smoke younger cigars that I feature on the Stogie Fresh 5 podcast or that I am just getting started with in a reviewing cycle. It is not until I get later on in the reviewing cycle of any given cigar that I may smoke a cigar that is a year and a half to two years of age. On the other hand, when I do get to smoke a cigar “just for myself,” I will often times dig into the archives. For example, I recently smoked a Dunhill from 1987 that was absolutely fabulous. SG: Do you buy cigars specifically to age? DS: You never can tell how good a cigar will get with age, nor can you be sure whether or not you will even like the cigar after is has some significant time in your humidor. I can taste an LFD DL Chisel, or La Aurora 100 Años, or Ashton ESG and say, man these are good, but they will have much more complexity and smoothness with a bit more age. But, you never really know until you actually try them when they are older. SG: What sort of questions do you get from Stogie Fresh readers about aging? DS: I do get a few questions from readers about aging, but not a huge amount. Many people who have recently gotten into cigars either don’t have the wherewithal to purchase enough cigars to lay down, or they haven’t yet had the time to enjoy the effects of long-term aging on the cigars they do have. Laying cigars down to age takes a major commitment: of time, of money, and of effort. Time is a concept that is lost on many cigar smokers. Many people buy cigars in small batches, say five to ten cigars. They buy them that way so they can smoke one or two and then “lay down” the rest to “age.” However, long-term aging may take years and will require much patience. This is difficult for many people who don’t have the patience to let their cigars age for more than a few months. SG: What are some of the major considerations to getting into aging cigars? DS: Ideally you should buy cigars by the box for aging. That way you can keep them in their original box and away from the influences of other aromas and flavors of cigars in the same humidor. Plus, by buying boxes, you will have enough cigars to enjoy periodically for the long term. In any case, this could cost a lot of money. Another monetary consideration is the space to keep all these boxes of cigars. People that want to seriously age their cigars must be thinking in terms of large volume humidors. Either large coolers, or cabinet style humidors, or walk-ins. Providing space for hundreds, if not thousands, of cigars can be costly. Finally, it takes some effort and even more patience to stick to a process that will reward you with the benefits of aging cigars. By keeping cigars in boxes you can pluck one out at various intervals and try it to note the changes that 3 months, 6 months, 12 months, and more have made on the smoke. If you smoke from a box of 25 cigars, at an interval of, say, one every 3 months, that box will last you 6 years. Thus, depending on how well you think a cigar will age, you must either slow your smoking or purchase more boxes. Either way, you can see the cost and time constraints. 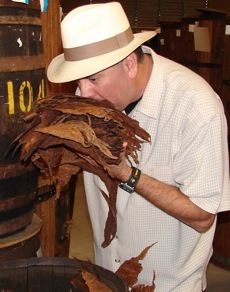 Many thanks to Doc Stogie for taking the time to speak with StogieGuys.com. Please check out his website, StogieFresh.com, for more great cigar information. The time and money issue is definitely a large consideration. I've been smoking cigars for about 7 years and have just finally been able to devote some space and cigars to the aging process within the last month. Part of it does have to do with having more cigars in your humidor than you can reasonably smoke within a month or so. I have found that buying 5 or 10 packs online does help in this case, though. As mentioned in the story, when I get several of the same stogie, I make sure I put down at least 2 or 3 of them for some future date. Doc Stogie thinks you should go with a whole box at a time, but I've always had trouble buying cigars by the box–I simply want to have a little more variety than that. I bought my third humidor about a year ago and that's how the space eventually became possible. My first box was a small desktop humidor, enough to hold about 50 sticks; this is now my "flavored" cigar humidor where I keep various Acids, Naturals and other Drew Estate-type sticks so they don't artificially flavor the non-flavored stuff. The newest box holds about 150 sticks and is my main box for everyday smoking as it sits atop a glass-encased liquor cabinet–beautiful piece of furniture. As it began to fill up, I was able to put some sticks back into my second humidor–a large tabletop model that will hold 150 to 200 sticks–and that's what I'm using for aging. This humidor is inside another piece of furniture, fairly well hidden, so I don't think about what's in it before going out for a stogie in the evening, so I'm not tempted to get into the aging sticks. Since I just started aging the cigars in this humidor, I figure I need to wait at least two years before touching anything that I've put there. But I wouldn't be able to get to the point of letting anything age that long without buying a substantial amount of multi-packs first. Thanks for the input! Keep us posted as you continue your aging process. Thanks for having the Doc on your site to talk about cigar aging. His podcast and your blog have been both educational and entertaining. Keep up the good work. Many thanks for your insight. You really can never tell how a cigar will age. I've seen some of the least heralded cigars age to the point of having the sought after "white powder coat" cover them and taste like a 50 year old Paragas Don Jaime. Conversely, there have been boxes of sublime "right out of the box" cigars that have tasted like one dollar cheapos after 5 years in the humidor. No matter what the box I've purchased, I take out at least 5 cigars for aging. The minimum is one year and will try one each year. Some cigars, when they have been issued as a limited edition (not necessarily Cuban LE's), go in the aging humidors for a minimum of 3 years and will be smoked on special occasions only. It's not only interesting but fun to pull out a cigar after a number of years, pour a drink you feel might be well matched to the tobacco and, hopefully, enjoy it until your fingertips burn. I would leave the boxes closed. Whether wood or cardboard, cigar boxes are not anywhere near airtight. I think keeping the boxes closed provides greater protection for the cigars. You might have known or you have to know that tobacco is very important for cabinet cigar humidor such that the right amount of humidity is maintained in order to keep good savor. Ok a couple of weeks or days but years? For what? Would a reputable cigar company sell you a stick thats not going to be a good smoke right away? Why wait. You cant take them with you if you die. ElTigre – Manufacturers sell cigars that they believe are ready to smoke at time they're purchased. But, as with wine, many consumers find improvements with age. Of course, this isn't guaranteed and I've written on Stogie Guys about cigars that did not benefit from aging.